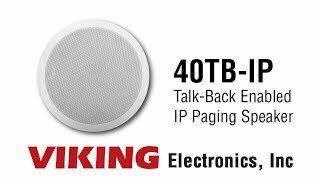 The Viking model 40TB-IP Talk-Back Ceiling / Wall Speaker enables two-way conversations via SIP and also allows for standard paging and background music via multicast. The Talk-Back Speaker easily connects with a single CAT5/6 cable from your PoE switch. Its shallow depth allows the speaker to be conveniently mounted in a standard 2″ x 4″ stud wall or ceiling. An auxiliary switch input allows a hard wired wall button to initiate a SIP call. Alternately, an optional wireless remote call button can be used (Viking model BTR-3, sold separately). A momentary button press will initiate a standard call, and holding the button for 3 or more seconds will initiate an emergency call. The remote can also be used to adjust the speaker volume. 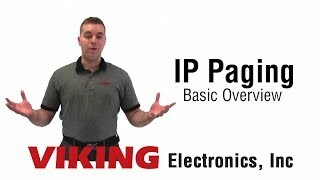 The LED on the 40TB-IP can be programmed to blink when there is call activity. The integrated microphone enables talk-back and also monitors room noise to automatically increase speaker volume when necessary. Line-level audio output connections are provided for connecting to an external amplifier. A built-in 6 Watt class D amplifier with speaker output connections is also provided to directly drive additional analog 8 Ohm speakers. A programmable relay output is provided for activating door locks, strobe lights, external amplifiers, etc. No room next to your door for mounting a Entry Phone? Mount the 40TB-IP in the ceiling above the door and use the existing door bell switch to activate a call.